The Boston Bruins have concluded their 10th annual development camp at the Ristuccia Memorial Arena in Wilmington, MA, and ended the relationship with the rink that’s been the team’s training facility for 30 years. Although this was the last at this site, it was my first road assignment,spending the entire four-day event getting personal evaluations on many young players that were drafted this summer, or the previous year. The experience was absolutely amazing, and after many hours of watching drills and the last day’s scrimmages, I gathered some info on the top-five players that stood out to me. The players unable to attend this year’s development camp were both selected in the 2015 National Hockey League Entry Draft. Boston University (NCAA) forward Jakob Forsbacka-Karlsson, a 2nd round choice (45th overall) is catching up on collegiate academics while traveling Europe with family. Sault Ste. Marie (OHL) forward and 1st choice (15th overall) Zachary Senyshyn has fallen ill recently with a case of mononucleosis. Both players were excused from participating in camp. This year’s event was led by several members of the Bruins coaching staff, such as B’s assistant coaches Jay Pandolfo and Bruce Cassidy. Last year’s assistant coach with the American Hockey Leagues Providence Bruins, Kevin Dean, was also on the ice conducting drills. Dean is the leading candidate for the head coaching job of the Bruins top minor-pro affiliate, as Bruce Cassidy was promoted to Claude Julien’s staff in late May of this year. Goaltending coach Bob Essensa was also a key member of this week’s event, as he worked closely with the four netminders that attended. Former NHL player and Bruins forward PJ Axelsson was also on the ice with the camp staff, providing advice to the young players. Axelsson is in his third year with the organization and has been the team’s amateur scout in Europe. A complete list of all camp invites can be found in my article published earlier last week before camp started. Below are five development camp standouts that I thought showed great promise during this week’s training sessions, listed in alphabetical order. Drafted in the 4th round (105th overall) in the 2015 NHL Entry Draft. This is one player that I really paid a lot of attention to after a stellar season in the WHL with the Prince George Cougars. Jesse plays a heavy style game on the ice, and can be an effective agitator, but his speed and his hands are what’s most impressive. He’s a forward that possesses a nasty shot with a quick release. Gabrielle is a gritty player that plays smart with or without the puck. He’s deadly when able to create space from an opposing player and has many ways to beat a goaltender in one-on-one situations. It remains to be seen where he’ll play in the upcoming season, as he’s eligible to return to the WHL, or play a full season in the AHL. Drafted in the 4th round (116th overall) in the 2014 NHL Entry Draft. Another player that I was excited to watch during the training week. He’s a very quick forward with a heavy shot and is an intelligent player in heavy traffic situations. One of my favorite things about Danton is his tape-to-tape passes. He has exceptional vision up and down the ice, and can get into those dirty areas when needed. I look forward to seeing him in black and gold next season as he’s set to join the Baby B’s for his first full year of professional hockey. Drafted in the 2nd round (49th overall) in the 2016 NHL Entry Draft. Ryan missed the first day of camp, but showed great promise in his remaining three days of training. His speed and shot is something to see live. He was most impressive during short ice 3-on-3 drills with puck possession and even better in the last days full-ice scrimmage. His positioning and ability to close the gap from oncoming pressure are one of his better attributes. He also possesses a highly accurate and powerful shot. His movement east to west along the blueline is another great asset to his game and has the intelligence to sneak along the half-wall for that one-time opportunity. It’s going to be fun to watch the beginning of his NCAA collegiate hockey career, as he’s committed to the University of Minnesota next season. Drafted in the 1st round (14th overall) in the 2016 NHL Entry Draft. This year’s first round pick didn’t disappoint any in attendance for the week-long festivities. 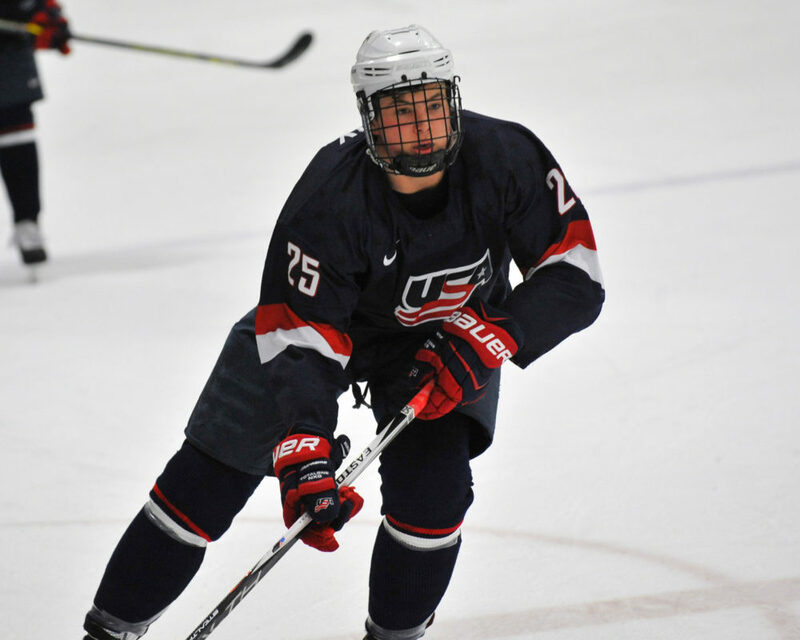 McAvoy showcased great quality’s to his game and has amazing intelligence for an 18-year-old Boston University defender. His speed with the puck was great to see and he’s got a cannon of a shot from the point. He passes very well and is another player with exceptional vision of the complete ice surface. 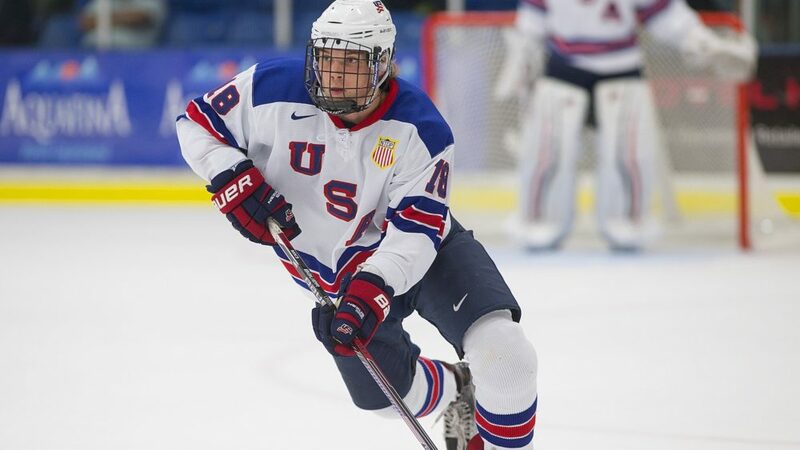 He has a big stride for an average sized player and incredible lower and upper-body strength. I look forward to watching him in the upcoming NCAA men’s hockey season as he’ll be entering his sophomore year at BU. Drafted in the 3rd round (75th overall) in the 2015 NHL Entry Draft. By far the most impressive netminder out of the four that were involved in this year’s camp. 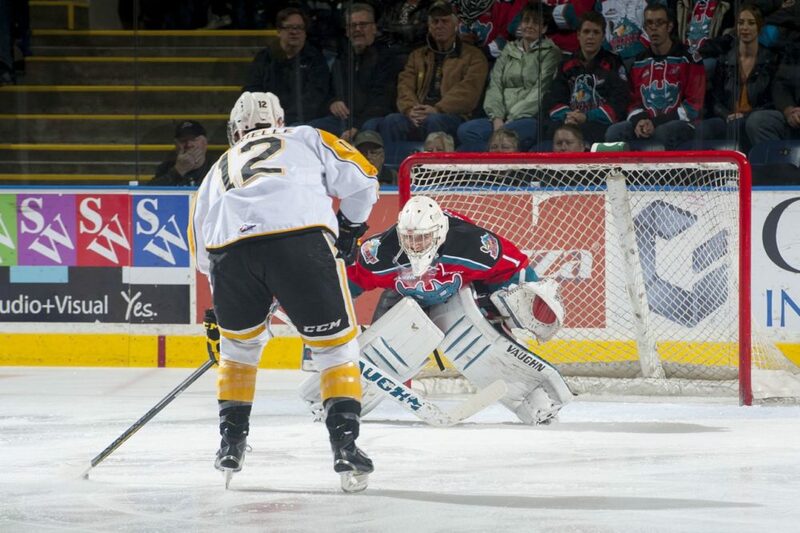 Vladar positions himself very well and doesn’t give shooters much to see with his big frame. He has very quick reflexes and is solid taking away any chances down low as he covers the post-to-post area very well. His rebound control is another big part of his game, but his glove hand when moving laterally down low could use more work. Vladar plays for the Chicago Steel of the United States Hockey League, and could very well return for this upcoming season, but I believe his development would benefit greatly if he were placed in the East Coast Hockey League with the Atlanta Gladiators for his first pro experience.